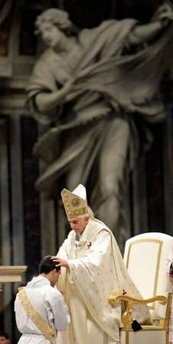 In the homily, the pope highlighted some fundamental aspects of the priesthood in the image of the “Good Shepherd”. 2) Celebrated each day, the Eucharist “should become for us a school of life, in which we learn to give our life. Life is not given only in the moment of death and not only in the moment of martyrdom. We must give it day after day. We must learn, day after day, that I do not possess my life for myself. Day after day, I must learn to abandon myself, to put myself at the disposal of that which He, the Lord, wants of me at that moment, even if other things appear more beautiful or important to me. Giving life, not taking it. And it is thus that we experience freedom. Freedom from ourselves, the enormity of being. It is in being useful that our life becomes important and beautiful. Only those who give their life, find it. 3) The priest must live in his intimate “relationship with Christ and through the Father, only then can we truly understand men, and then they will realise they have found a true shepherd”.